The iconic and trailblazing Rambert join forces with the Rambert School this winter as they present some of the most exciting pieces from the choreographers at the forefront of their genre. Bringing together some of the worlds most thrilling young dancers, Rambert2 presents the pieces that launched Rafael Bonachela and Sharon Eyal's careers, a brand new work from Rambert's Guest Artistic Director and a final performance of Christopher Bruce's classic Ghost Dances. This haunting and hypnotic duet garnered world-wide acclaim when it premiered back in 2004. Now over ten years later, Bonachela's piece based on the personal lives of two dancers is still unrivalled in its transcendence. Combining traditional ballet sequences with staccato and punchy movements Killer Pig is an innovative look at femininity without any physical compromises. Christopher Bruce's Ghost Dances is lauded as one of contemporary ballet's iconic pieces. With the symbolic 'ghosts' Ghost Dances depicts death's rule over everyday life and love. Seen Rambert2? Loved it? Hated it? Sound good to you? 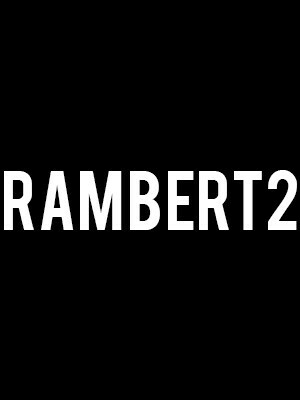 Share this page on social media and let your friends know about Rambert2 at Sadlers Wells Theatre. Please note: The term Sadlers Wells Theatre and/or Rambert2 as well as all associated graphics, logos, and/or other trademarks, tradenames or copyrights are the property of the Sadlers Wells Theatre and/or Rambert2 and are used herein for factual descriptive purposes only. We are in no way associated with or authorized by the Sadlers Wells Theatre and/or Rambert2 and neither that entity nor any of its affiliates have licensed or endorsed us to sell tickets, goods and or services in conjunction with their events.